If you are new to Lightroom, you may be looking for the Save command, such as you are used to from other photo editing software. But Lightroom does not have a Save command. For this reason, new Lightroom users often ask: "How do I save the photos I have edited in Lightroom?" Lightroom is a non-destructive editor, which means the pixels of your original photo are never changed. All the information about how you have edited your files is automatically stored in the Lightroom catalog, which is actually a database behind the scenes. If enabled in preferences, Preferences>General> Go to Catalog Settings, these editing instructions may also be saved with the files themselves as metadata, or in XMP "sidecar" files – a data file that sits alongside the raw image file. 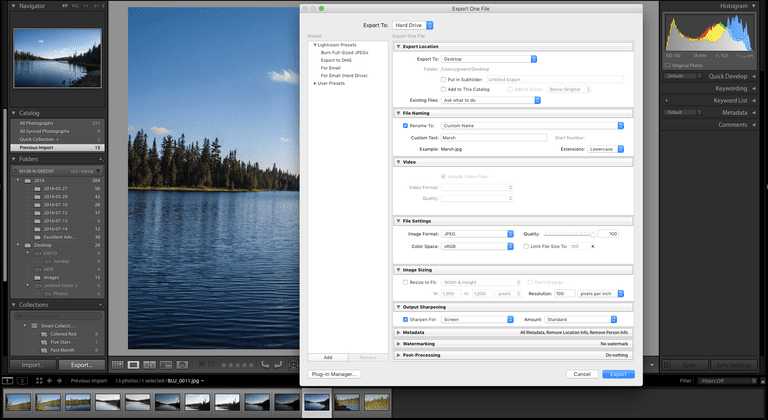 Instead of saving from Lightroom, the terminology used is "Exporting." By exporting your files, the original is preserved, and you are creating a final version of the file, in whatever file format is required for its intended use. Choosing Export from the file menu. Right-clicking on the image and selecting Export from the Context menu. Clicking the large Export button at the bottom of the left side panel in the Develop module. Use the keyboard shortcut Ctrl-Shift-E. However, it is not necessary that you export your edited photos until you need to use them somewhere else – to send to a printer, post online, or work with in another application. Export Location: All this is asking is "Where do you want us to place the file?" The Export To pop down gives a lot of choices. If you have a particular folder for this image select Export To>Specific Folder. Click the Choose button and locate the folder. If you want to add a subfolder you will be asked to give it a name and then you are asked what to do with Existing Files. File Naming: There are a number of choices here but the most commonly used is Custom Name. The name is entered in the Custom Text area and you will have to decide if the extension will be in uppercase or lowercase. This is more personal preference than anything else. It has no effect on the output. Just be aware the name you assign to the file will be used as the default name for any subsequent files you will export. Any time you hit this area, be sure to change them. Video: Yes you can export video out of Lightroom. Just be aware there are only two video formats: MP4 or DPX. If you want to retain, say, the .mov or another format, then you have to select Original, unedited file. File Settings: This is where you set the file format. The formats available are JPEG, PSD, TIFF, DNG, and Original. A notable exception to this is PNG. Once the format is chosen this area will change to provide you with a number of options specific to the chosen format. Image Sizing: This area lets you resize the image to specific dimensions and resolution. Output Sharpening: You can choose to apply a bit of sharpening to your JPEG, PSD, or TIFF photos when you export. The amount of sharpening applied is based on the format and resolution you specify. Watermarking: You can add a copyright watermark to JPG, PSD and TIFF files. You can also add a custom watermark. Post-Processing: This area lets you determine what to do after the image or video has been exported. If you often export files using the same criteria, you can save the settings as an Export Preset by clicking the "Add" button in the Export dialog box.